New Beginnings and What the Hell Just Happened? For millions of people, waking up on Friday was quite the shock. It was frustrating in the lead up to the vote for me because not living within the border meant I couldn’t vote on my future. I’m one of those people that will plan years in advance for certain things, particularly big things. Moving back to the UK is pretty big, especially with finances. I knew if the vote swung Leave it would really upset the pound and markets. Despite what Boris claimed. Because of the time difference my husband and I were glued to our iPads refreshing the vote counts on the BBC website until after 3am Greenwich time. The writing was on the wall but I’d hoped something would change while I slept. While I applaud the attitude of respecting how people voted, I find it disturbing the trend of googling after the vote ended asking what the EU was or what could happen if the vote was Leave. I don’t care what you vote for but I do care if you understand the ramifications. And the videos of interviews of people saying they didn’t understand or didn’t think their vote mattered when they voted leave and they wish they could change it bothers me. I hope cooler heads prevail when the discussions on how the UK exits happen. I do think the EU should have a do over with a healthy dose of hindsight. There are a lot of benefits to having a single block but there needs to be more cultural sensitivity. Whether it has to do with the pint or trying to regulate a cheese made in France for centuries, these things should be allowed to thrive. But since we’re not invited to the table we’ll just have to wait and see what happens. In the meantime I got to meet my newest nephew. He is just over three weeks old and a little peanut. His only worries are sleeping and eating. 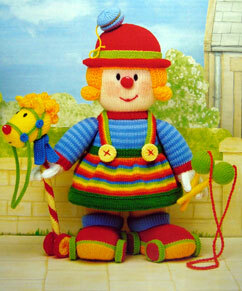 Now I know how long pregnancies last, do you think I planned ahead to crochet something for him? Alas, no. So once he was born I went into a bit of a panic and rushed out to buy yarn. I managed to get the blanket and the little beanie done quickly. I had bought a book, Crochet Step by Step by Sally Harding, to relearn crochet. When I was a baby my aunt had crocheted a blanket using a shell pattern so I wanted to do a similar pattern. The book gave me the stitch count and I came up with how many I needed to do the size I wanted. 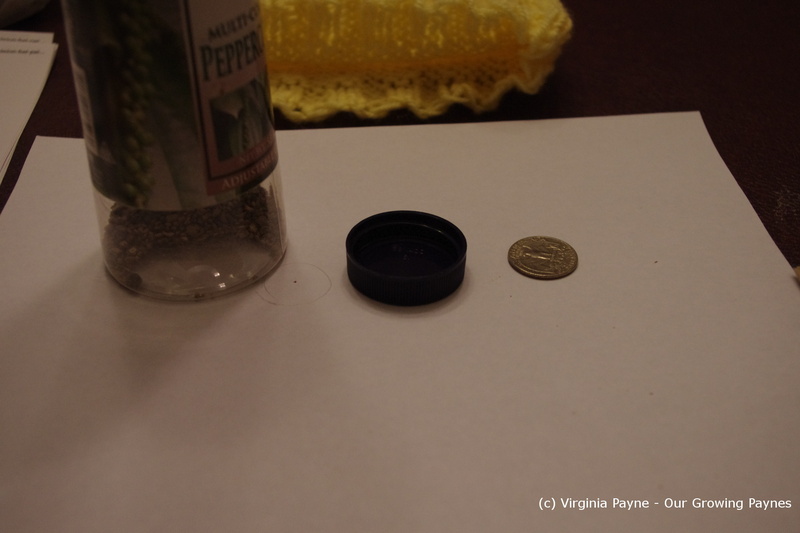 The little beanie was very easy to make. 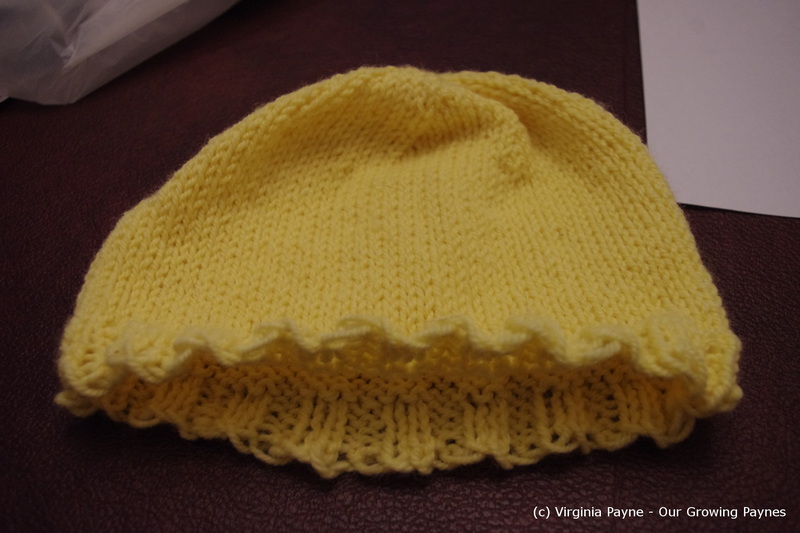 I used a pattern from Mango Tree. 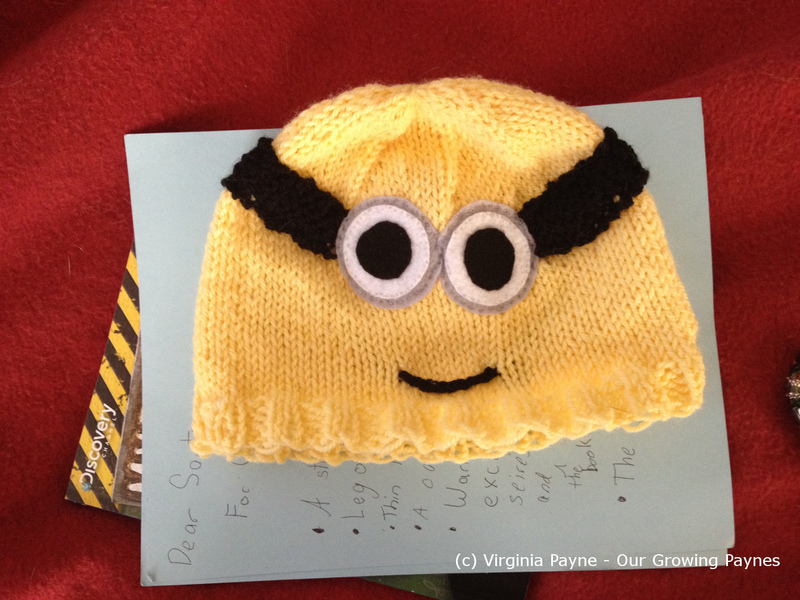 It is a free pattern and she gives instructions for sizes from newborn to adult. So even though the world can still turn upside down, life goes on. And that’s ok.
Like millions of people in this world I find myself on a journey of healing. Both emotionally and physically. It’s a bumpy ride of leaps forward and backward. I’ll be starting physical therapy again as it turns out my back is unstable enough to be reinjured by putting my little nephew to bed, sneezing, and pulling up a handbrake in my car. That’s not frustrating or anything. I was finally, a couple of weeks ago, given meds to help manage the fibro. I was told today it can take a couple of months to kick in but I’m keeping my fingers crossed it will help. It has helped with depression and anxiety which is a major plus. So I will keep going with it in the hopes that it will tick all the boxes. Emotionally I made a breakthrough. Several weeks ago something happened that was like ripping off a bandaid. For years I was always in protective mode from being under attack but not realising where it was coming from. Now I know. It’s both heartbreaking and illuminating which makes it hard to process. But for the first time I feel like I’m going to get to a place where I am healed. I’m more relaxed in a lot of areas in my life now. I can take deeper breaths. And that translates into my family life as well. I feel really positive. Now if I can just get through the day without sneezing! Given this is March, this is obviously a late post as it’s about a gift I made for Christmas. Been working a lot of hours this tax season! I wanted to make gifts this Christmas, one to save money, and two to give something personal. It’s a way I show my love. Because I am a slow knitter and stuff with yarn work I had to branch out and pick something new. I decided it was high time to try Mod Podge. I just didn’t want it to look cheesy. Let’s just say some of the projects in the introductory book are a little over the top! I thought making coasters would be a great way to use some of my favourite pictures of flowers I’ve taken over the years. 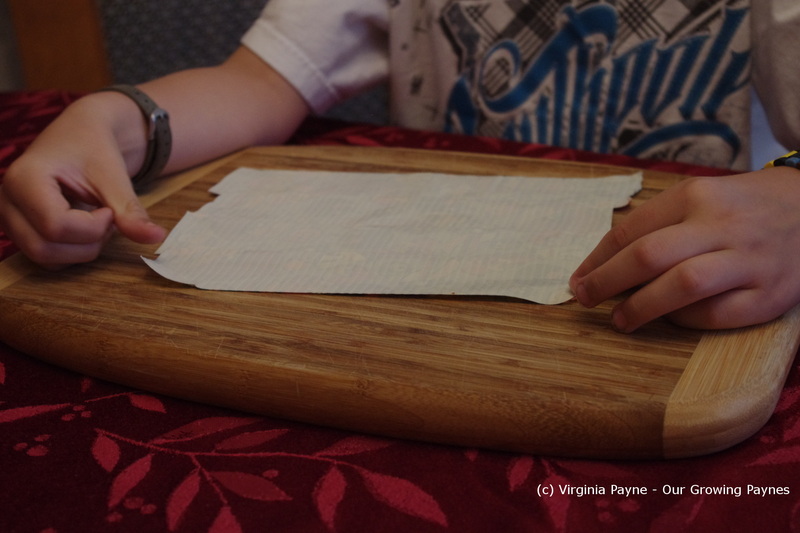 And it is relatively inexpensive to make once you buy the basic supplies. I bought a bottle of matte mod podge, glossy mod podge, and acrylic spray. For this project I bought white tiles and cork to go on the bottom on the tiles. Print out on photo paper the pics you want. Trim to size. 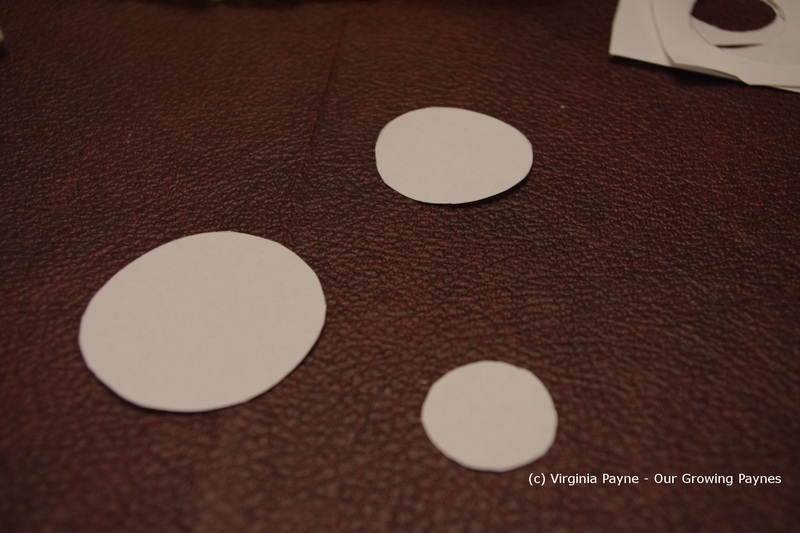 Because photo paper is heavy use craft glue to afix the pic to the tile and smooth to make sure there aren’t any bubbles. Let that dry and set for a day. Then paint the mod podge over the pic and the sides of the tile. Don’t put it on thickly. It will cloud the pic but it dries clear. This requires 3 coats but it is very important to make sure each coat dries completely before doing another coat. Glue the cork onto the bottom of the tile. Now the first time I did the coasters this is the point I screwed up. For some reason I stacked the tiles and weighted them down so the cork would stick. Dumb, dumb, dumb. The glue seeped through and ruined the integrity of the mod podge. So I had to repeat the previous steps and start over. To make the coasters waterproof do about three light coats of the acrylic spray, allowing it to dry completely between coats. I also did up a project for each of the kids. My son loves Minecraft so I printed out some images and arranged them in a creeper pattern on a canvas I painted green. I used the glossy mod podge for this. It’s a little trickier getting the photo paper to stick to canvas so I had to be really patient. My daughter has done her room in greys so I printed out three pictures of our travels in black and white and mod podged them onto square canvases. I used the matte mod podge without any sprays for this project. All in all I like this technique and have a few ideas to try after tax season. The only pain in the neck is trying to do it with pets. 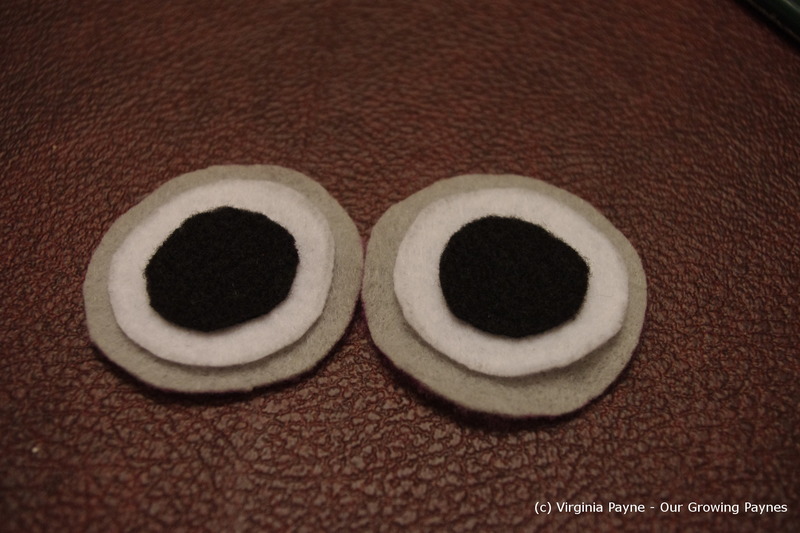 You invariably find dog or cat hair in the mod podge after it dries. Or as it is drying and trying to remove it is a delicate process! School’s out for summer! It is the first full week of school holiday and we’ve gotten loads of rain. So we’ve been stuck inside. We saw the sun this morning but it’s disappeared though rumour has it the sun will be back. I really hope so as we were thinking a bit of mini golf would do the trick. The rule is on their day’s off they can watch a bit of television in the morning. But not all day as that just rots their brains. I know, that’s what parents have said since the thing was invented but the crap that’s on nowadays really does rot the brain! To keep things interesting we do crafts. 🙂 They asked about making duct tape wallets to go along with the duct tape bags they made during school break in April. 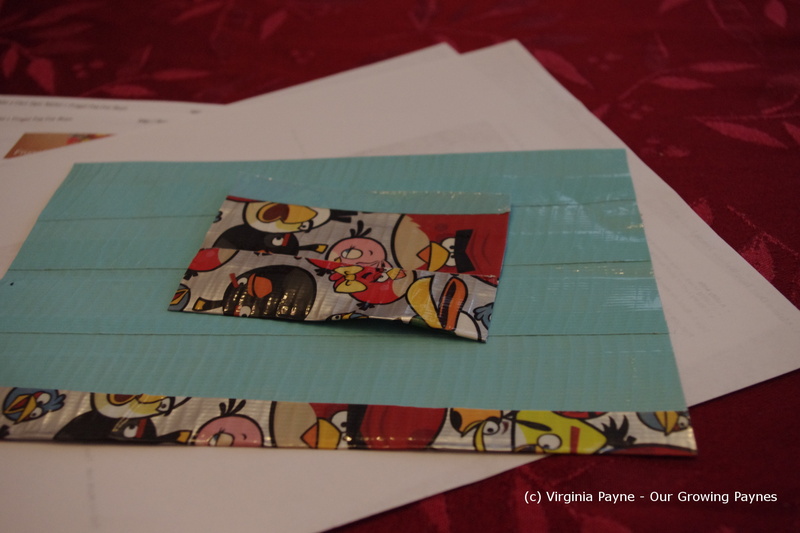 I went back to my pins and found this method for making the wallets from FrugalFun4Boys. Looked relatively easy so we went for it. Just don’t underestimate how it can go wrong with a 9 year old boy and seriously sticky duct tape. There was a redo here or there but we got there in the end! 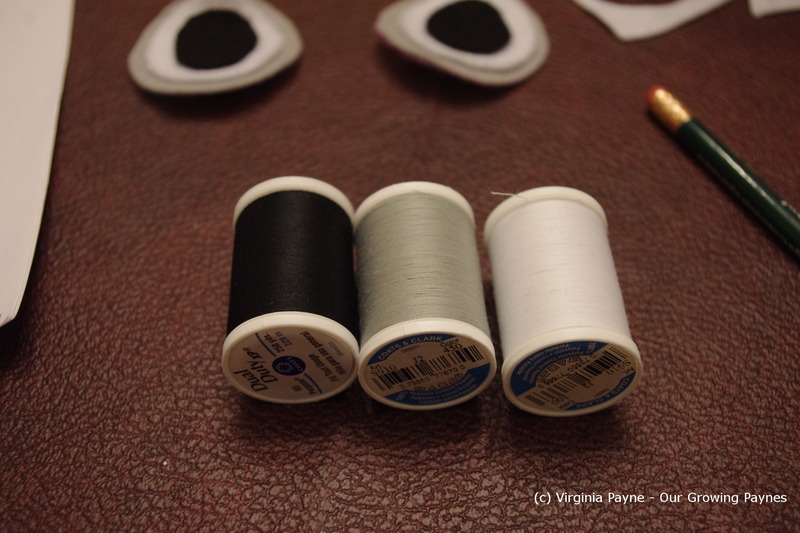 To do this you will need the duct tape of your choice, sharp scissors (I learned from last time! 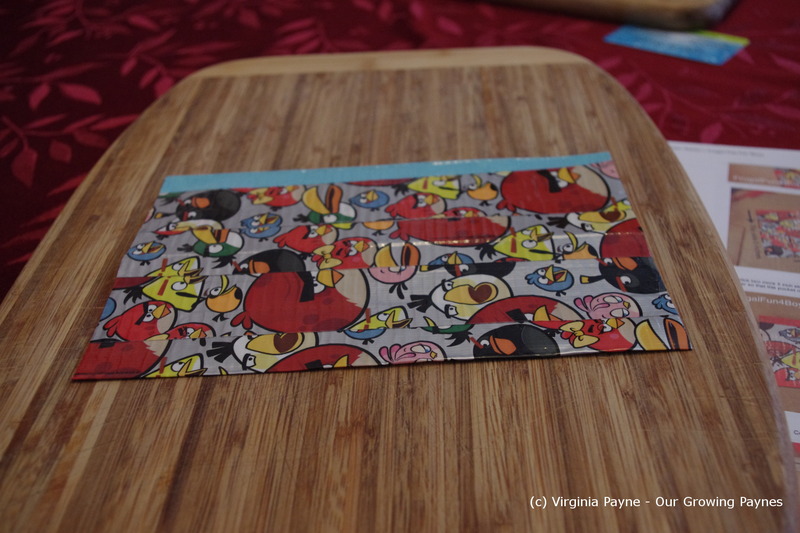 ), a cutting board, and either a paper cutter or a utility knife. If you use a utility knife a straight edge like a ruler is recommended. 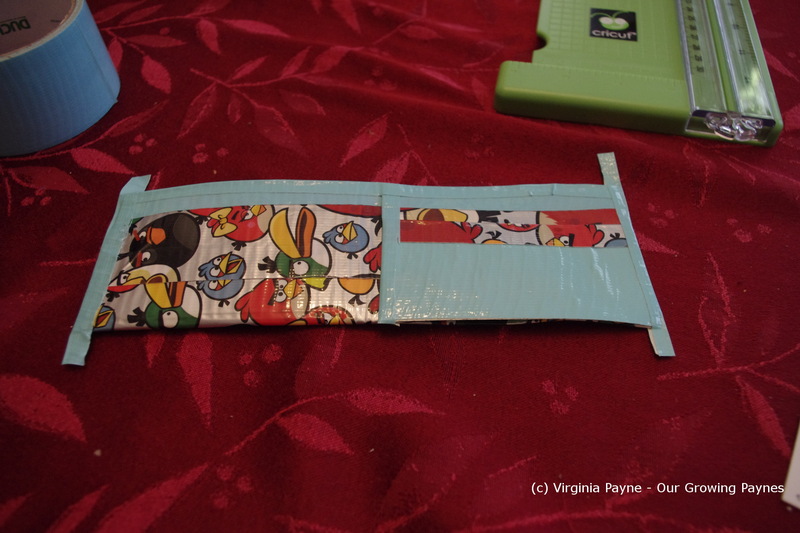 Cut 9″ strips of the first duct tape and overlap 1/2″ lengthwise. Then do the same for the second type of duct tape. 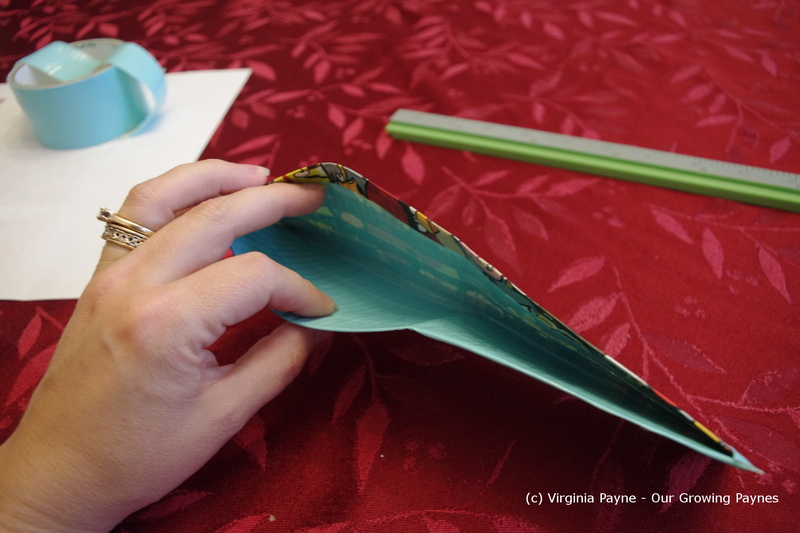 Stick those together leaving 1/2″ top and bottom to fold over and seal the edges. The edges on the sides need to be cleaned up so I used the paper cutter for this. It wouldn’t cut all the way through but it scored it so it was easy to cut and be in a straight line. 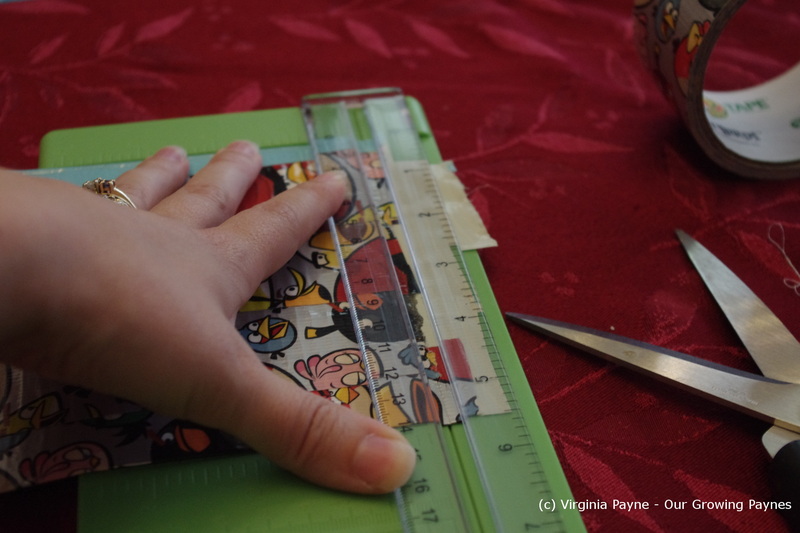 The finished dimensions on this part should be 8.5″ x 6″. 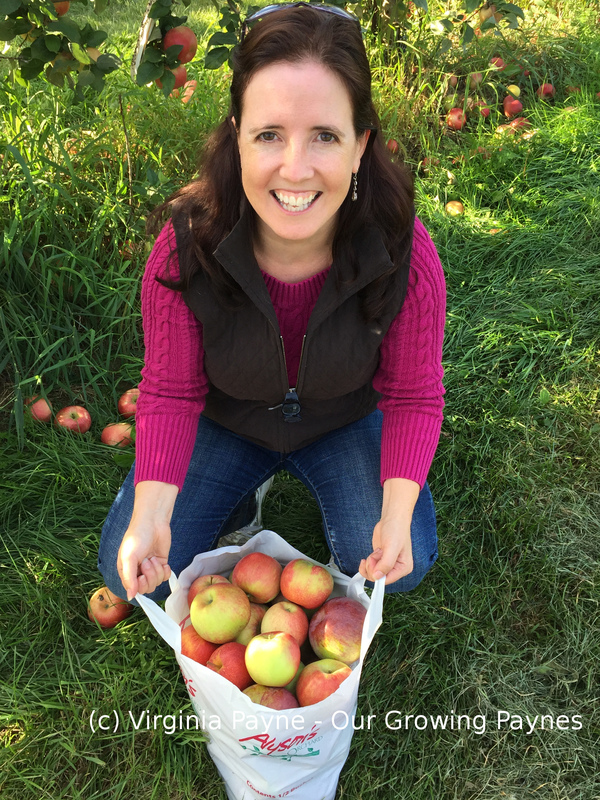 We got 8.5″ but the 6″ came out a bit short. Given that he was eyeballing it I think my son did pretty well as it is hard to get exactly 1/2″ each time! Set this aside and begin on the credit card pockets. It is helpful to have a card on hand to make sure it would fit. 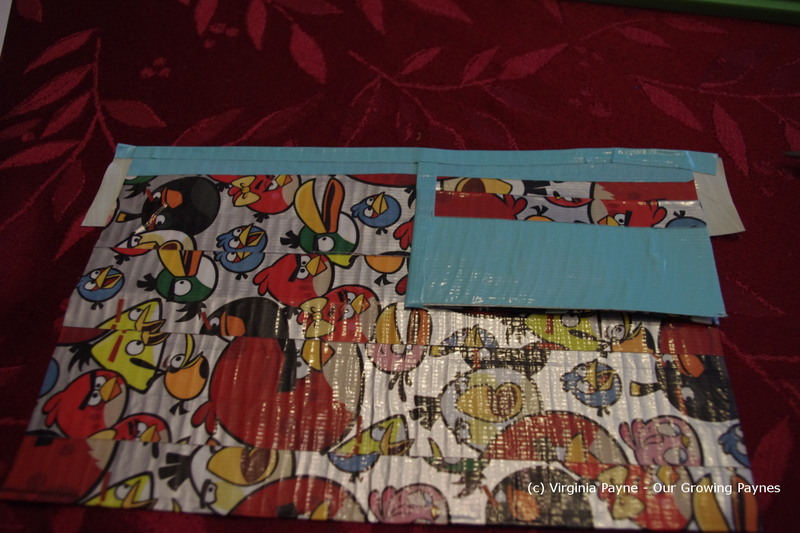 The method is the same as the first component but tear off 2 5″ strips of each duct tape and stick together. 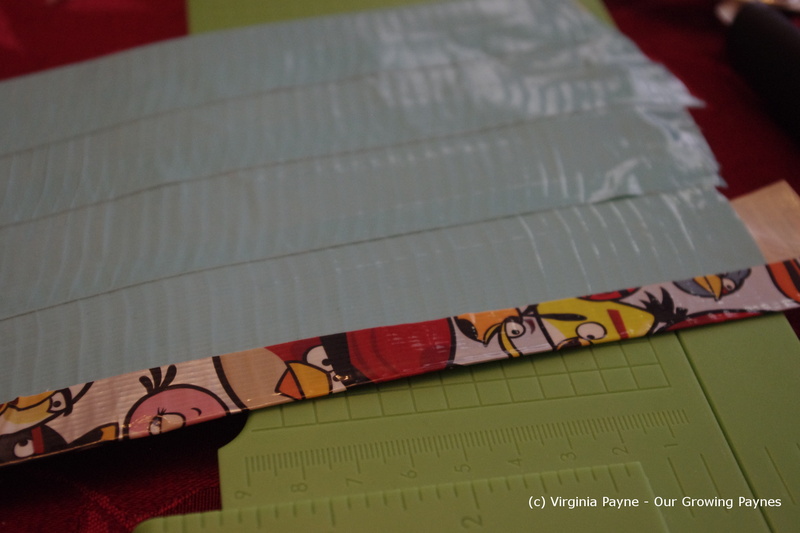 Trim to 4″ wide. Because the wallet was coming out a bit short we only had room for one more pocket but these directions are the same for two pockets or three total. 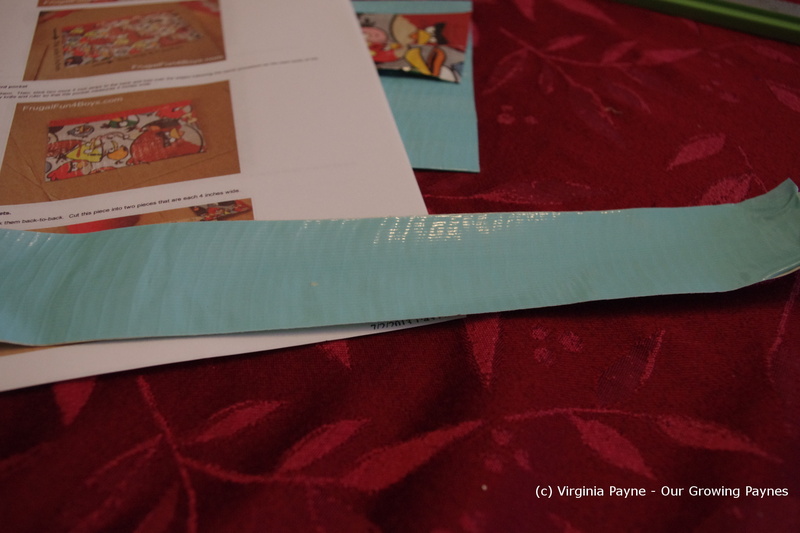 If you had room for 3 total you would take 2 strips 9″ long and stick them together then trim two pieces 4″ wide. 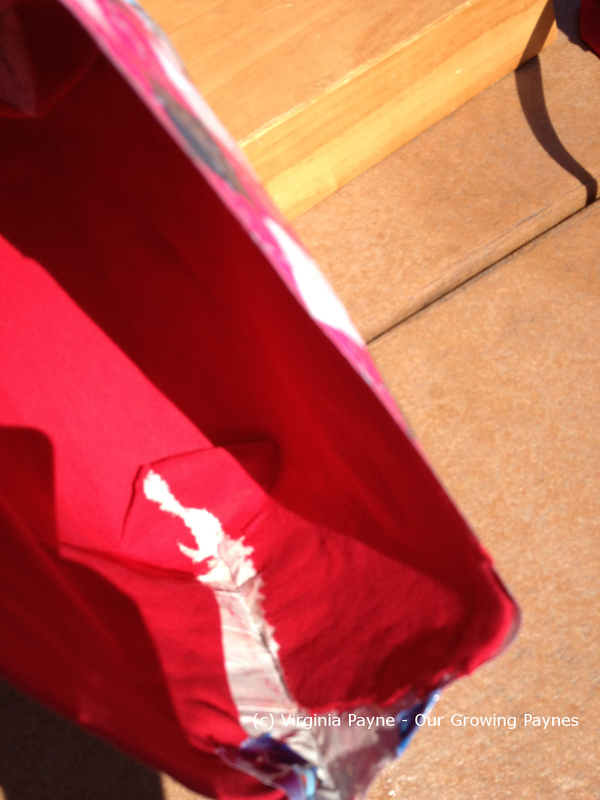 I sealed the top of the small pocket with the contrasting tape. Next line up the pockets and place a strip of tape down the left side. 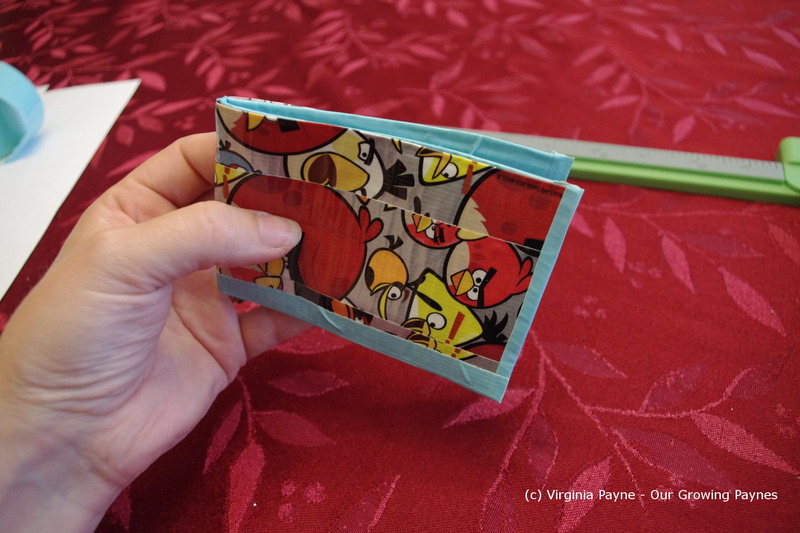 Trim the excess and then place it on the top of the main wallet piece. 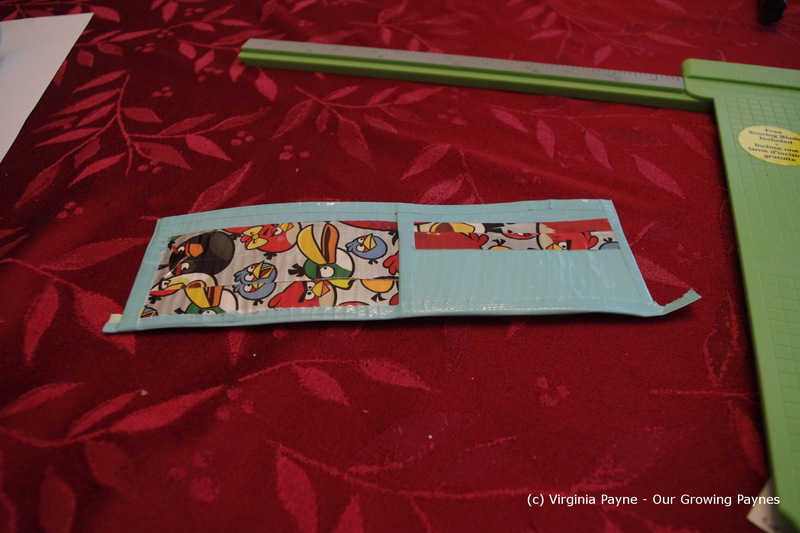 Because of the way the wallet will be folded it needs to be placed on the side that will be the outside. 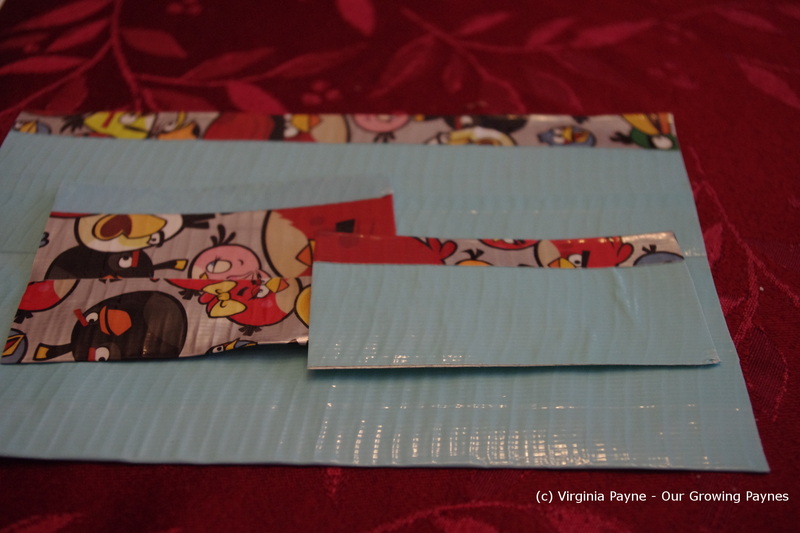 Tear a narrow strip and place it along the top of the wallet sealing the pockets onto the wallet. 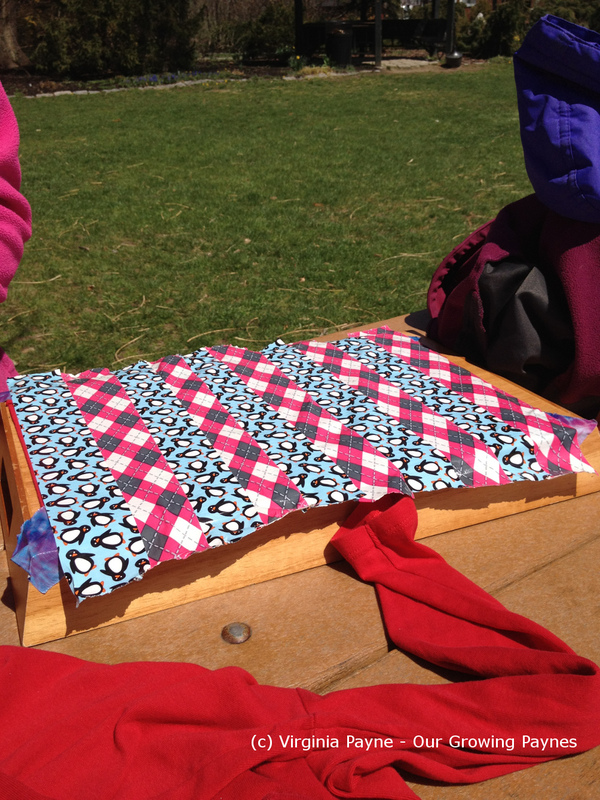 Fold the wallet in half with the pocket on the outside of the fold. Tear two more strips and seal the short ends. Trim then put one more strip on the bottom and trim. 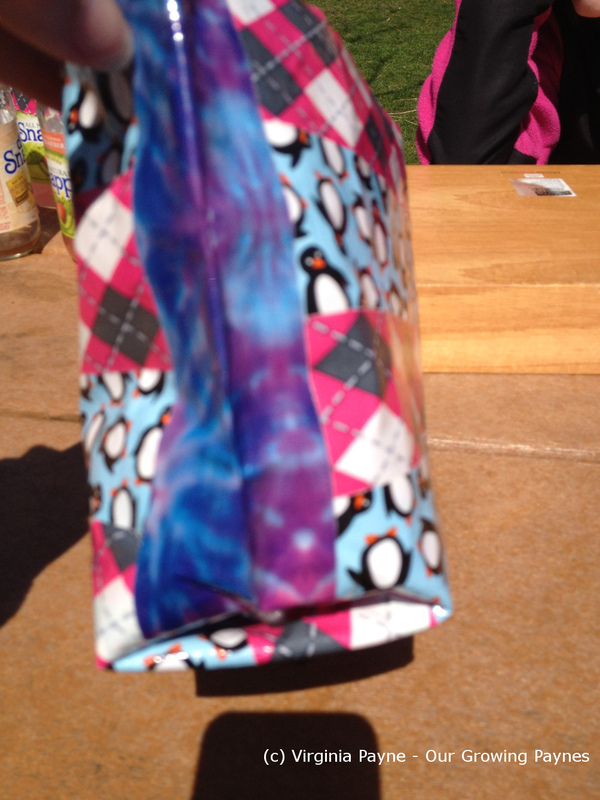 Fold in half with the pocket on the inside and you have a wallet! This past week was the spring school holiday for our kids and I like to come up with different “theme” days for them. 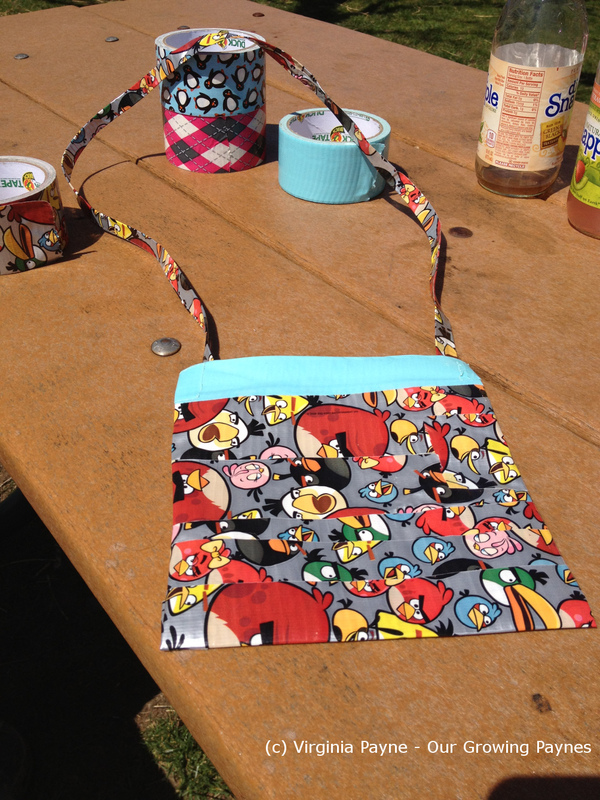 Thursday was craft day and I was looking for inspiration for crafts and I found a few blogs talking about duct tape purses. I have to admit I did not realise how popular this had become and the wide variety of duct tape that was on offer. It’s a bit mind boggling! 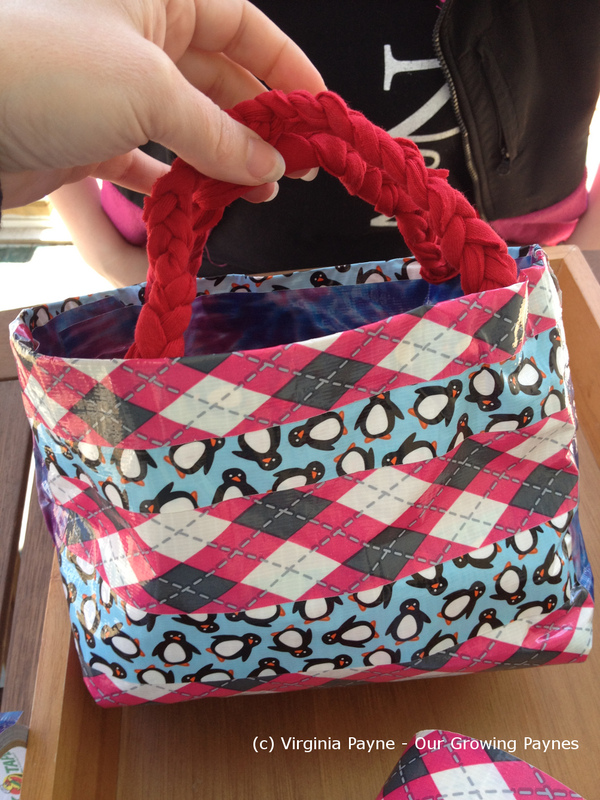 I took my inspiration for my daughter’s purse from All Things Thrifty. So off we went to the store to pick out what duct tape the kids wanted to use. My daughter had an old shirt that didn’t fit anymore so it was perfect for this project. I recommend using a tray as well for this. And a good pair of scissors. Sounds like a no-brainer but I grabbed our worst scissors and as we were doing this at a park with a picnic we ended up struggling a bit. We’ll know better next time! 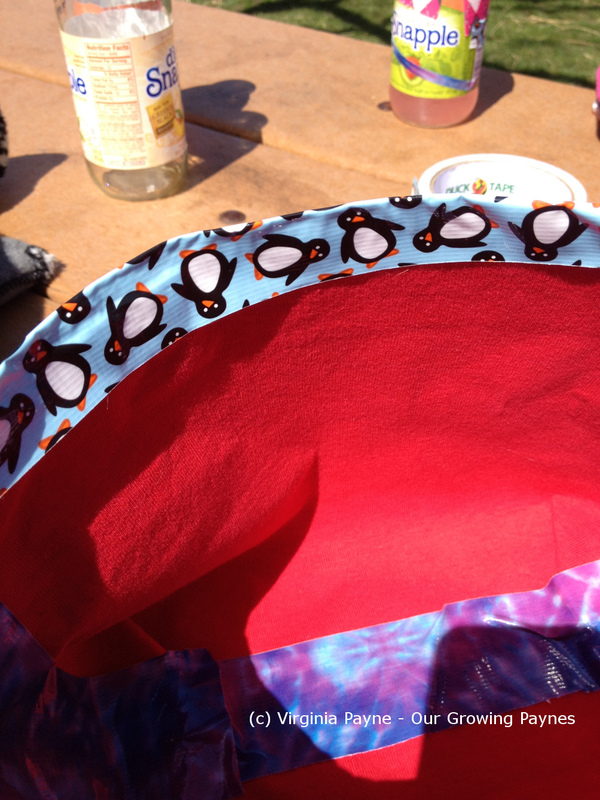 Cut out a piece of fabric that is the size you would like for the purse. This will be folded in half to cover both sides of the purse. Tape it down on the backside of the tray. 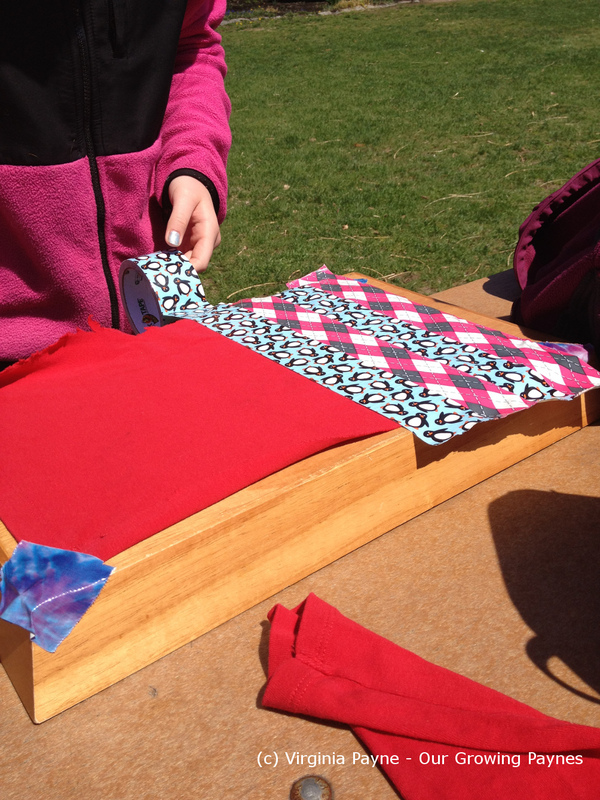 Take the chosen duct tape and cut to length you need and tape it down in the pattern you want on the fabric. 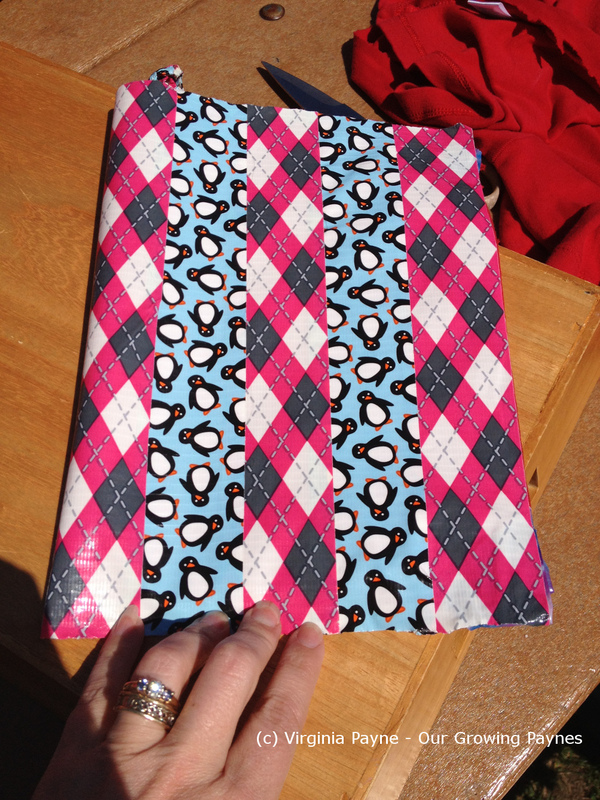 My daughter wanted horizontal stripes for her purse. Trim the tape it is all even on the edges. Remove from the tray and fold in half. If you used good scissors the fabric would have been cut smoothly and you won’t have to worry about the tape sticking together. I didn’t do that so there were some tricky moments! 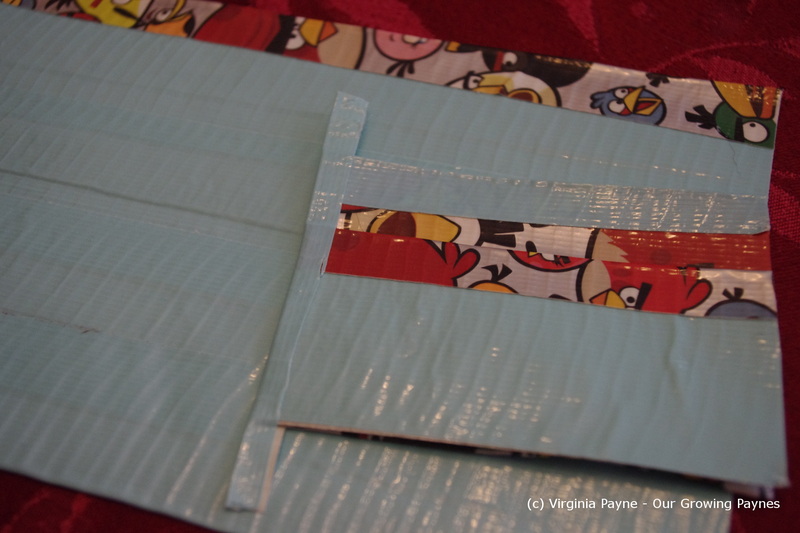 Next tape up the bottom and inside seams to strengthen and finish off the edges. Also, tape along the top to finish that edge. 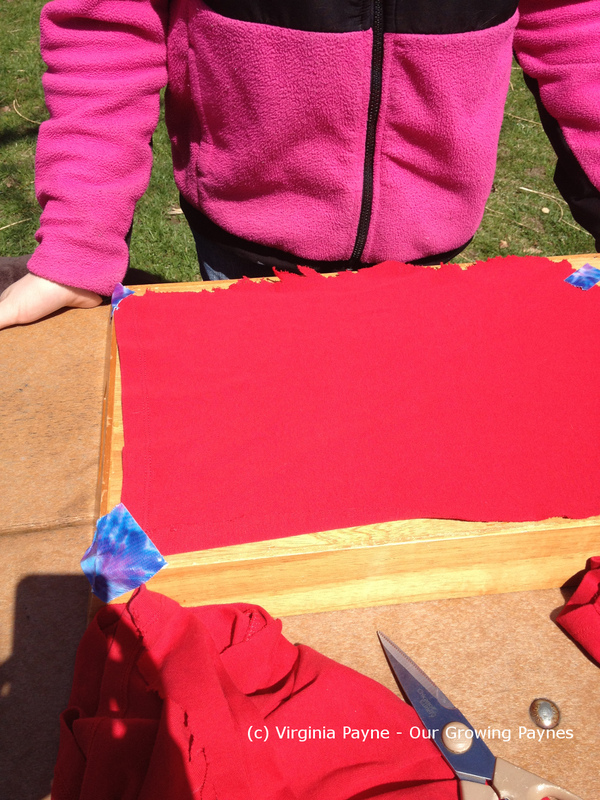 My daughter chose to have fabric handles so we took the sleeves of the old shirt and cut them into strips. 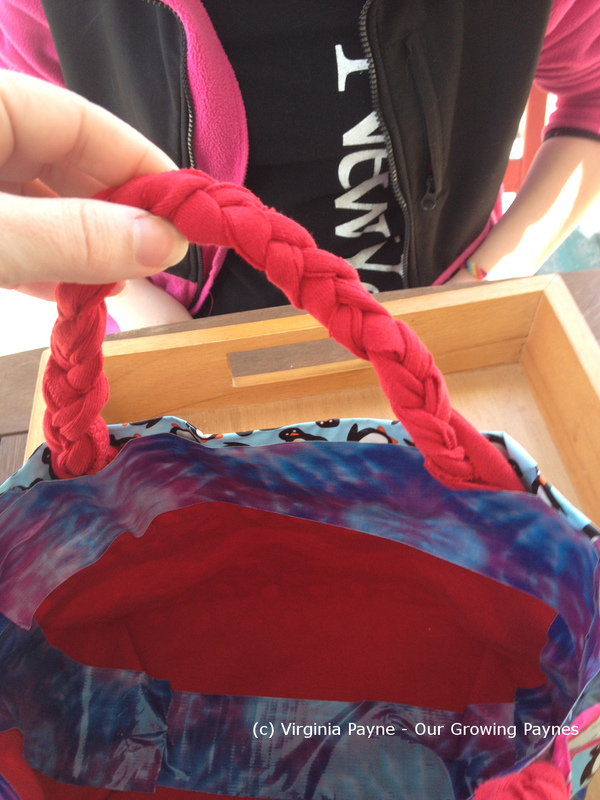 Then we braided them and attached them with tape to the inside of the bag. And before you know it you have a really cute bag! When Rich and I were in England earlier this year I was introduced to Jean Greenhowe’s patterns for knitted doll figures. They are really adorable so when I got back I looked for them here. I was able to order a few books online and they came this week. 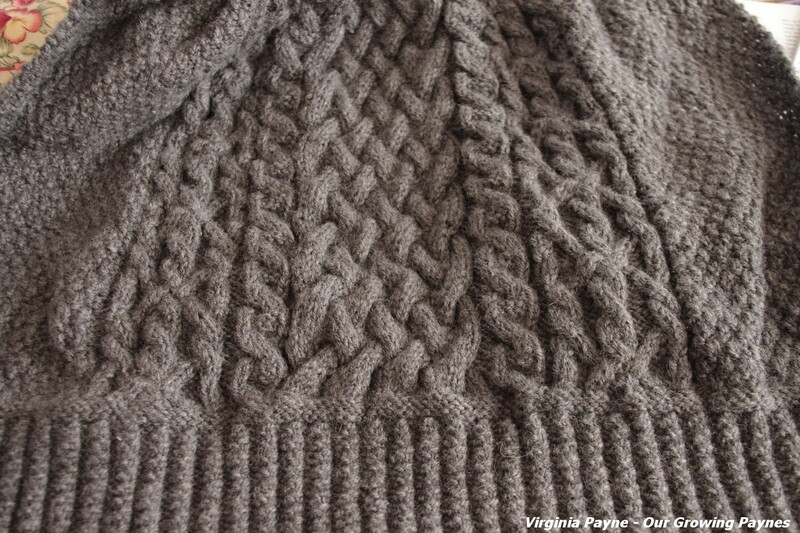 Turns out this is a lot easier to knit than Aran jumpers! Given that it’s mostly st-st go figure. 🙂 My kids love them too so hopefully I can get this one done quickly then make one each for my kids. 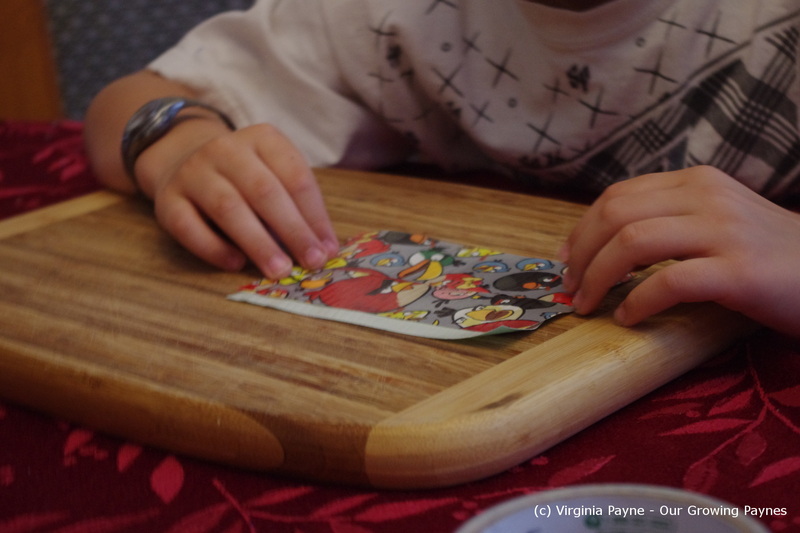 There is a pirate I can do for my son and a cooking one I can do for my daughter. I’ll post a picture of the finished project when completed. 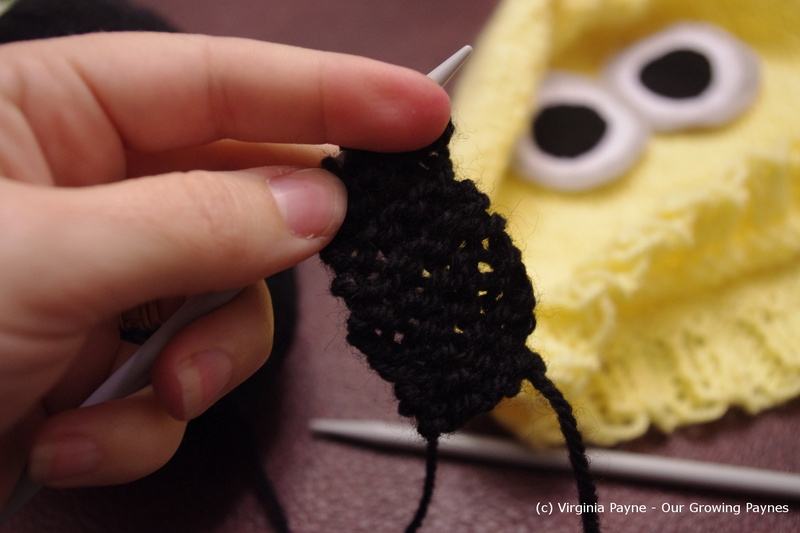 Full disclosure, I may be one of the slowest knitters out there. Which would have caused my Grandma to shake her head in wonder as her fingers could fly. My dad has a long torso and he would come home and ask for a cricket jumper to be knitted. It would invariably be needed within the week and she would get it done. 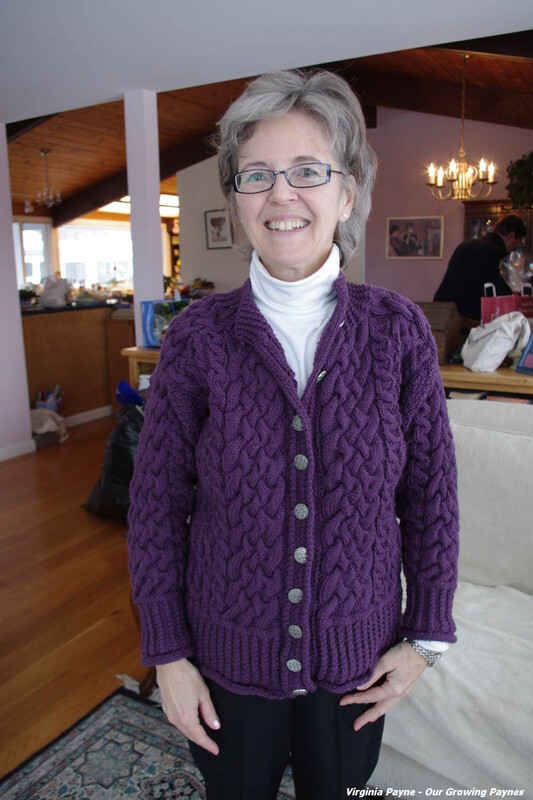 The first jumper I knitted was for my dad, it took me a few months and I would spend a few hours most days getting it done. Needless to say I’m in awe of what she could accomplish. We spent an hour or so painting our markers for our veg garden. 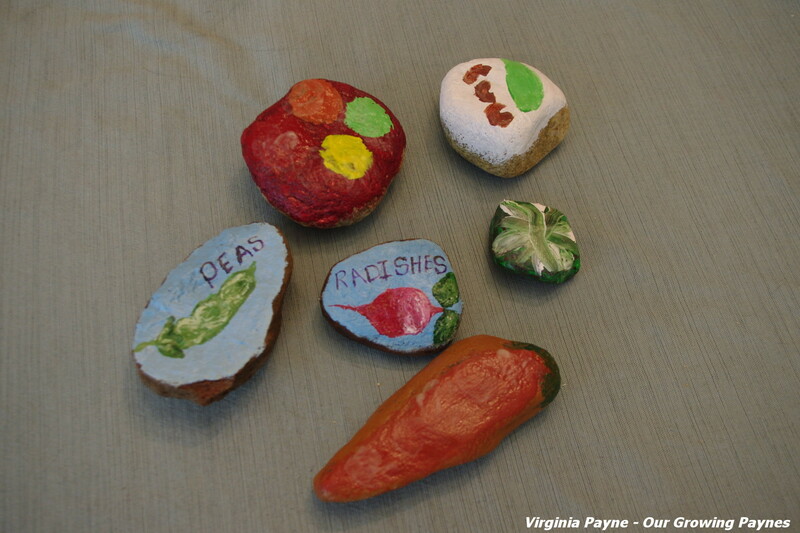 After they dried I sprayed a clear coat of acrylic paint onto the rocks. We then painted designs with glow in the dark paint! The kids got such a kick out of this. It is very easy to do so we’ll definitely do more of this as we have time since we plant so many different kinds of veg.